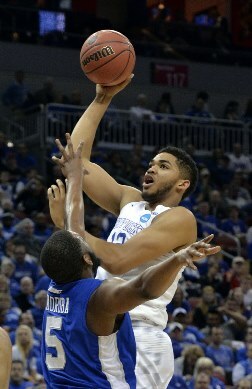 Popular sentiment these days is that the Timberwolves will take Kentucky big man Karl-Anthony Towns with the No. 1 overall pick in next week’s NBA Draft. The thing is, most of the people saying it are likely either taking educated guesses or repeating what they’ve heard elsewhere. It doesn’t make it less true, but it’s also true that it’s hard to find authentic NBA Draft insight this time of year. As such, when someone such as John Calipari — Towns’ college coach at Kentucky — starts talking about draft projections, it is worthwhile to pay attention. It didn’t just sound like the random musing of a coach who hopes his guy goes first overall. Calipari is among the most plugged-in men in all of college basketball, and by extension he is plugged into the NBA because so many Kentucky players are drafted every year. Now: The “unless something crazy happens” part softens the overall statement a little, but I take it to mean that based on Calipari knows from talking to other plugged in basketball folks and Towns himself, that is who the Wolves will pick.